Private, over-water bungalows, an on-site dive center, and Kri’s rich reefs and Ransiwor sandbanks right at the door. Fabulous. Yenbuba Homestay has four private over-water bungalows, and two private bungalows on land. Western Kri’s wonderful reefs and sandbanks are at the door. 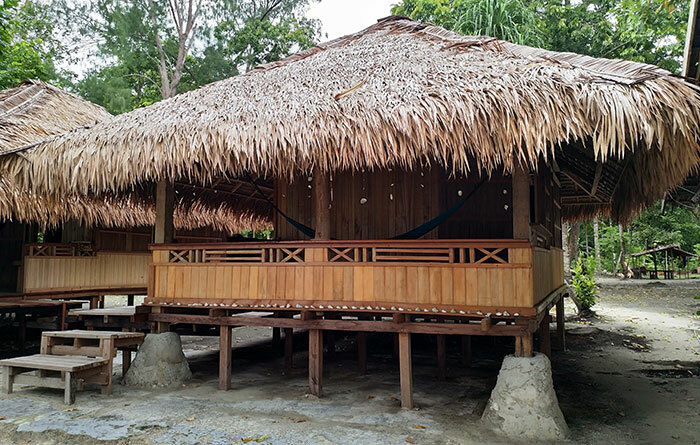 All bungalows have verandahs with table and chair settings, hammocks and ocean views. Bungalow bedrooms have double beds equipped with pillows, bolsters, sheets and mosquito nets. The over water private bungalows have glazed windows and solid, lockable doors. 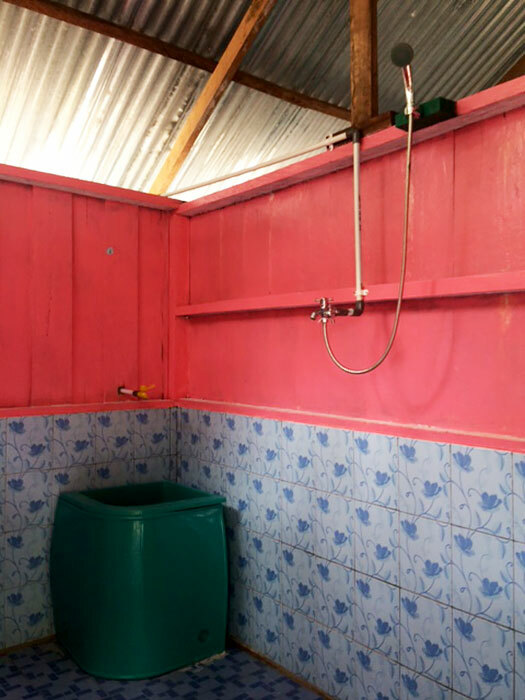 Bathroom facilities are shared by guests. 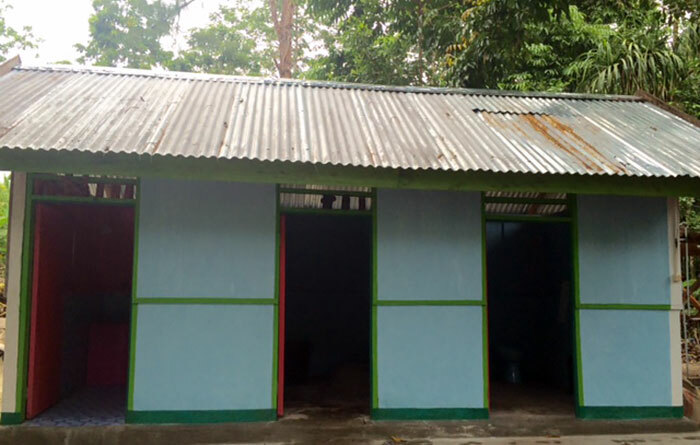 A tiled, three room building contains bucket bathing and a shower in one room, a western style toilet in another and a squat toilet in the third. Meals are served in a large concrete-floored dining room with views across the strait to Gam and Waigeo. The dining room has two large tables with bench style seating and free tea, coffee and drinking water are always available there for guests. Power outlets are available for charging devices. There’s good mobile phone reception with data services available at Yenbuba Homestay. Electricity is provided by generator for device charging and lighting from sunset to about midnight. Mansuar’s Yenbuba village is a ten minute boat ride away and basic supplies can be purchased there. As for all Raja Ampat homestays, please take any inorganic trash you generate away with you: You’ll be contributing to the rubbishing of Raja Ampat if you don’t. English is spoken at Yenbuba. Waisai transfers cost IDR 500,000 each way (IDR 1,000,000 for the round trip), with cost shared among passengers. 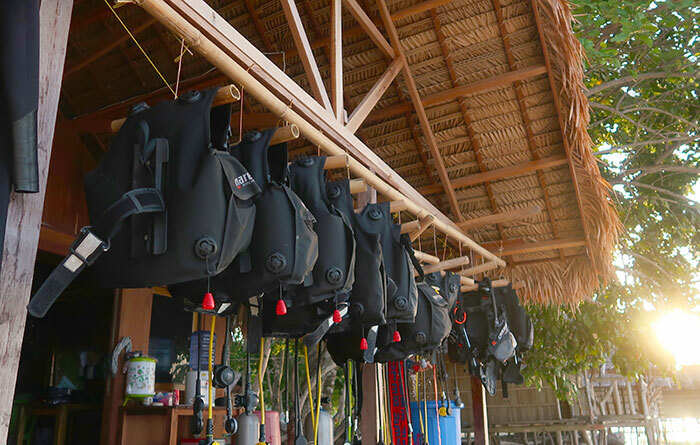 Soul Scuba Divers is based at Yenbuba Homestay. The dive center is run by western instructors and has a great reputation. Yenbuba has great snorkeling on its house reef beyond the inshore seagrass shallows. 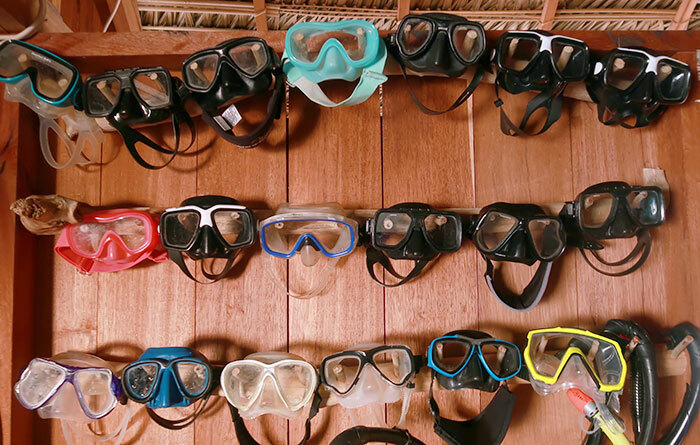 You need to bring your own snorkelling gear. At low tide extensive sandbanks join Kri to the nearby islet of Ransiwor and beyond that to Mansuar. The sandbanks are worth exploring to see the myriad of creatures trapped in the tidal pools, but be sure to wear sun protection while doing so! 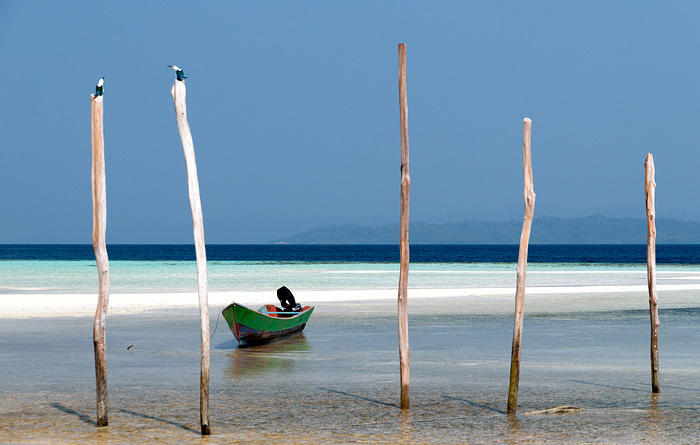 The sandbanks also provide access to the village of Yenbuba on Mansuar, which has some great snorkelling beneath its jetty and in the channel between Yenbuba and Ransiwor. Be aware of currents if you decide to explore the channel. The sandbanks make it possible to walk to Yenbuba at low tide, but be careful to time your return appropriately or you’ll be in need of a boat to get back. Paths lead to the heights of northern Kri behind the homestay, from where panoramic Dampier Strait views can be had. The jungle you’ll pass through on the way is rich with birdlife and if you’re quiet and observant you may encounter one of Kri’s resident monitor lizards. Long walks along the north shore of Kri are possible at low tide, and crossing the sandbanks mentioned above will open up the possibility of long treks from Yenbuba to the other villages and sights of Mansuar. 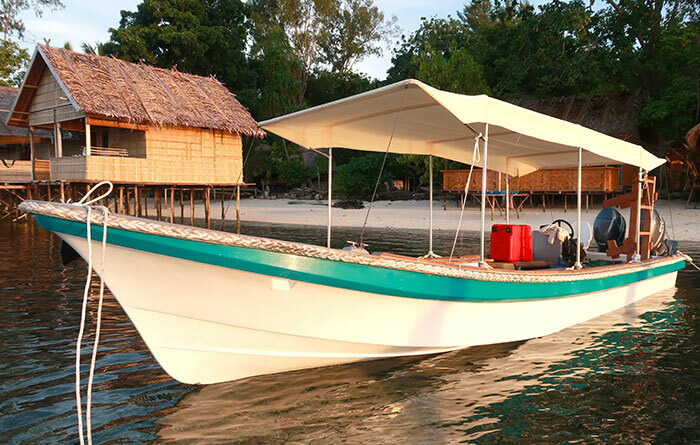 Yenbuba can organise a variety of guided tours in Raja Ampat. Prices for the most popular of those are in the table below. Just ask if you’d like to organise a custom tour. I rarely write bad reviews. All the staff were very nice. And Rose, the manager, speaks really great English. •	Seeing lots of plastic waste on the beach in front of the homestay. You can recycle non-crushed plastic bottles and soft plastics at SoulScubaDivers.com next door or almost any plastic waste via Bank Sampah in Sorong. They kindly picked me up from the Sorong Port with many pounds of plastic waste I found at this homestay. •	Hearing loud sound of motors from boats right in front of our bungalow, even at 10pm. 1. A room with a working lock. She gave us the only room without a working lock. We only picked her place because it seemed to be the only one with a locking door. 2. Tempeh each day because I’m vegan. We were there 8 days and we only had it twice. I asked guests at Mangkus Homestay around the corner if they have tempeh. They said they have it at each meal. I absolutely agree with you that there is a trash problem on beaches—but not beaches in front of Yenbuba Homestay—beaches all over the world. Trash from Waisai, Sorong and all over the world is constantly swept onto the beaches in Raja Ampat. One day there won’t be any trash, and the next day due to a certain current, you will have plenty of plastic washed up on the beach. Yes these people have a responsibility to pick up waste on their beaches, especially in front of their establishment. But us tourists have to understand that the mentality and education of these local people is still evolving. They very much understand that trash is bad but they’ve become desensitized to it. Walk through the streets of Waisai for a day and you’d start to become used to seeing plastic strewn about also. Of course there needs to be more support from the government and other awesome organizations like Bank Sampah who’s doing great work but can only do what they can so far (they’re quite new). 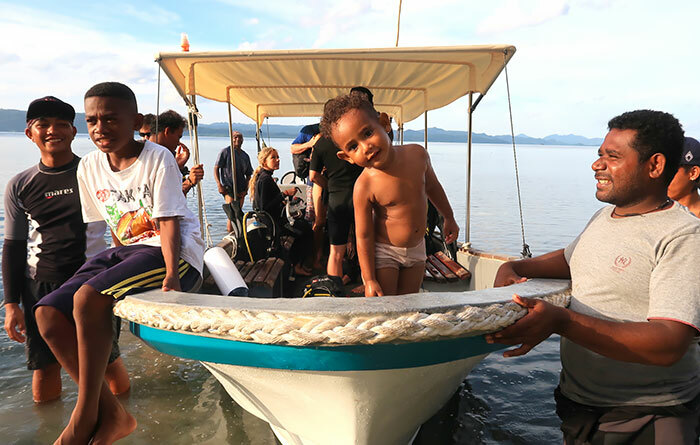 The people of Yenbuba Homestay don’t throw their trash in the sea and are starting to inform their family and community the dangers of burning plastic. The children of Yenbuba village are doing beach cleanups, making eco bricks and learning about the dangers of plastic more and more as time goes on. Rather than blaming locals we tourists need to do our part in educating them and supporting them. It’s so great to collect plastic and other waste and bring it back to Bank Sampah in Sorong but it’s not enough yet. We need to have conversations with locals, share ideas. And when a good opportunity to donate to a cause that’s tackling the waste problem arises, donate to it. I agree with Orsi and Gabi, we had a wonderful time there, our second time there ,yes we came back and I was amazed about the new beautiful bungalows. We had the chance to meet, Rose. It was interesting to talk to her, she gave us an insight into Indonesia. Thank You again from me and my husband. this is the place to be , we stayed 13 days in Yenbuba cottages this year (2018 and in 2016, in 2014) and it is our favorite place to be. The food is delicious and they serve a lot. People are absolutely lovely, they are all very attentive and helpful. Rose , the manager, is there to help with everything, excursions, boat rides, …. she is a very good manager, it is a delight to talk to her. 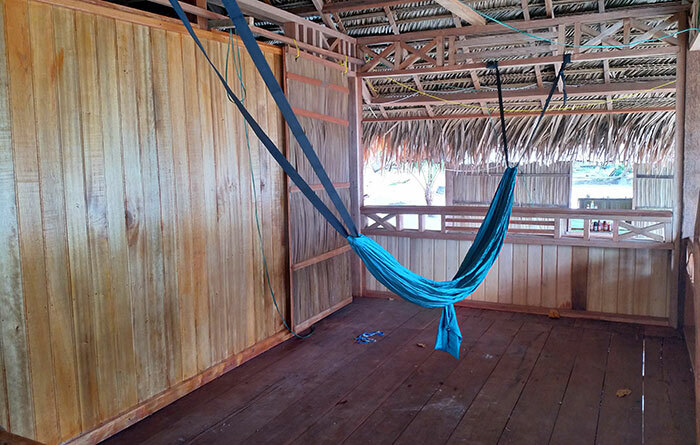 Agus and his team have built two lovely new cabins on land, with local material,very solid, good beds, good matresses, environmentally friendly!! (They are not in the pictures here), they have now four cabins on water, too. World class snorkeling is right there, in front and in the back of the place. The tourists I have met there are really nice and interesting to talk to, they care about the environment, too. I agree that the manager (Rose if I remember Well, from Jakarta), is not available and not really reliable. Food, family, pick up, trips, drop off, everything was fantastic. We all loved our stay at Yenbuba and Keluarga pak Agus and Ibu Rose were a total delight to be around and blessed our group with wonderful care and kindness! I spent 6 days at Yenbuba homestay with my mother end of March- early April. It was the nicest place I have ever been. There are many homestays in Raja Ampat but Yenbuba has the best view in my opinion. Food was excellent, very fresh, tasty and big portion. The bungalows are clean and friendly, the staff is also very welcoming. The manager is very helpful and speaks good English, she advised amazing trips for good price. Yenbuba Homestay was for me the best place to stay in Kri Island. I spent 10 nights there and everything was perfect. Variety of dishes everyday, the bungalow confort with a real mattress, the staff and the management of all small things you need. For sure I will come back again in that place, people were so friendly. I’m diver and I really enjoyed the underwater life. All people I met with snorkels were also too happy by they have seen underwater. So don’t hesitate. If you have any doubt or request, contact Rose, she will take care on all your requests. 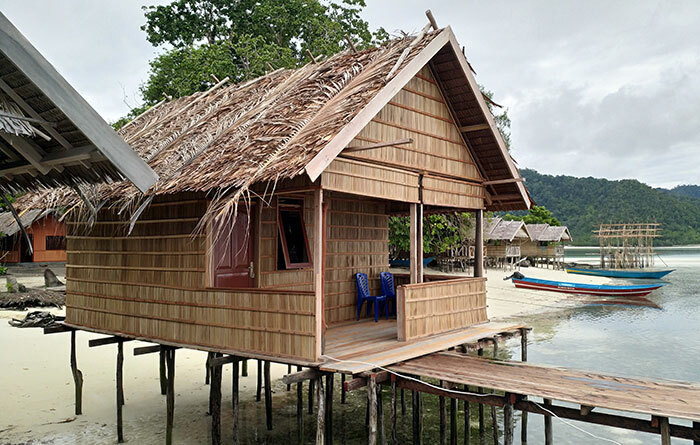 Arrived at Yenbuba Homestay exactly one year after our first stay we found the disfigurement on the beach of Kri island with the construction of new bungalows in the most beautiful point of the beach that overlooks right in front of Mansuar island. There is no longer the wonderful view that was there before. 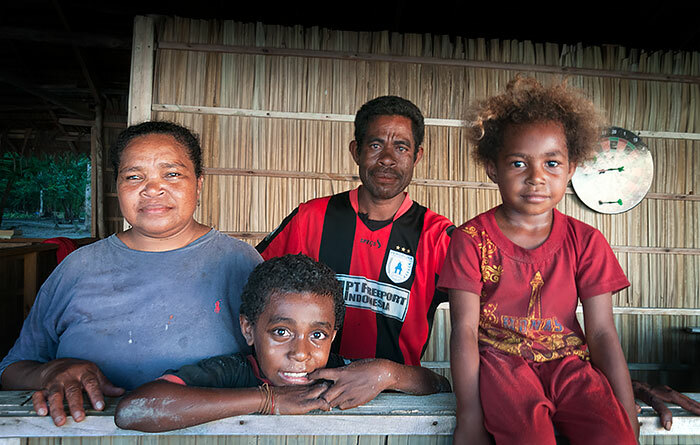 We asked if they were from the Yenbuba homestay and we were told by Rose, the manager who were from the Mangkur Kodon Homestay, and the next day we learned that they are owned by Rose, not the Papuan people. The management of the Yenbuba homestay worsened, we had rats in the bungalow, and less attention in all compared to the previous year. Since Mrs. Rose from Jakarta has started her buisiness, she is no longer taking care of the Yenbuba Homestay. We went to 3 different homestays in Raja Ampat. this area of the world is amazing, but we were a little bit desapointed about Yenbuba Homestay. we have been stung by a kind of flea. I guest that it is because the lunch room is on the sand (many insects, of course it’s nature). The manager try to be nice with tourists but with difficulty, she’s very stressed. Not really reliable on trip organization with no advice about location to visit. Still the view is nice and even if there is nothing on the island the beach is nice. What a pity there are now more and more bungalows on this beach. After Checking out from Ano homestay which didnt welcoming us at all ..
We were so in love with this place, Rose wasn’t there so we have pak Agus ( the owner ) to welcoming us. Pak agus is so friendly. We love the food here so so much , its the best we had in every homestay in raja ampat. 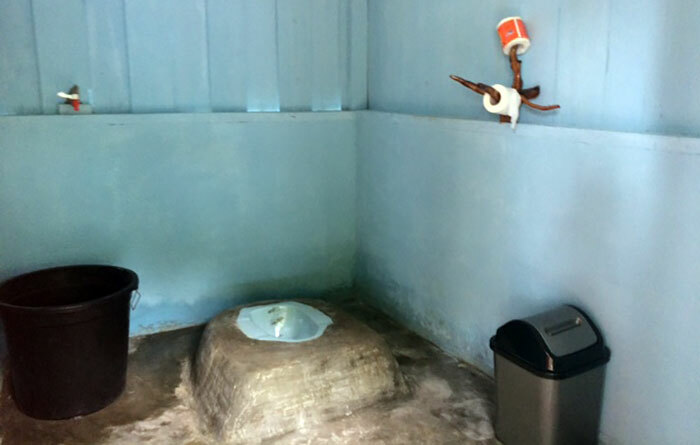 Very clean bathroom with fresh water. Yenbuba Homestay was paradise. The location is stunning. The over-water bungalow was a beautiful experience. We saw Raja Ampat epaulette sharks under the boardwalks every night, and the front-row view of the sunsets was surreal. The food was impressive and varied. The snorkeling was incredible, especially on Kri’s southern shore. We loved exploring the area spanning between Lumba Lumba Bay and Yenbuba Jetty. Note that at falling tide, the current races southward through the channel between the islands, and the opposite occurs at rising tide, at least in our experience. You can avoid the current by walking along the rocks around the eastern tip of Kri. Avoid low tide, since some coral is shallow, and you should never touch coral. To enjoy your time the most, go with the local rhythm. The change of pace is why you come here. The weather can change suddenly, so you need to be flexible. The seas can get rough in an instant, but bad weather can also suddenly improve. In our experience we had no miscommunications or hiccups. Pickup and dropoff went perfectly. Rose speaks very good English, which is great. Be prepared for big insects, beautiful spiders, a chorus of animal noises at night, and maybe a critter in the rafters. Everything is open air, and again – this is why you come here. I love night sounds, but earplugs helped. After a night or two, though, I became accustomed to it. The mosquito net was nice and sturdy, which gave peace of mind. The overwater bungalow was nicer than I expected. There was a drying rack for wet clothes (very helpful), an indoor plug, indoor and porch lighting (for when the generator runs), and there was even an electric fan in our bungalow. The fan was nice to have, but not really necessary. It wasn’t too hot at night, and a cool shower (there is no hot water) right before bed makes for a comfortable bed time. Our stay was like living a fantasy – we hope to be back! I spent 10 lovely days at the wondeful Raja Ampat Islands. Yenbuba homestay is a very nice place to stay, bungallows are clean, comfortable and with mosquito-net. The feeling and the athmoshere is amazing, and the place is very quiet only you can hear the sounds of nature which was a real speciality for me. Rose, the manager of the place is a thoughtful, caring person, who was always available when we needed her regarding for example arranging a boat for us or preparing the early breakfast/takeaway lunch when we left early morning for our trips. She speaks very good fluent english. Food was very delicious, each day freshly made: something sweet for breakfast, and mainly fish, rice, vegatables, eggs, chicken, pasta and some specialities for lunch and dinner. Try the unique sweet soyasauce (Kecap Manis), that is special for Indonesia. The environment is just like a real paradise on earth. The family living there is a cute little family with helpful, sedulous family members. I pretty much suggest the place if you want to hide away a little bit from the running world, if you are fed up with the accelerated world, if you want to enjoy life a little bit more, behind the scenes” in an impulsive, enthralling, charming environment. J’avais selon les avis lus décidé de passer mes premiers jours au Raja Ampat au yenbuba . Un des commentaires étaient élogieux quand à leur fiabilité pour les rendez vous. J’ai du tomber un mauvais jours car ils sont venus me chercher au port avec plus de 3 h de retard sur l .horaire envoyé à plusieurs reprises. Logement sur terre basique comme partout .bonne nourriture . 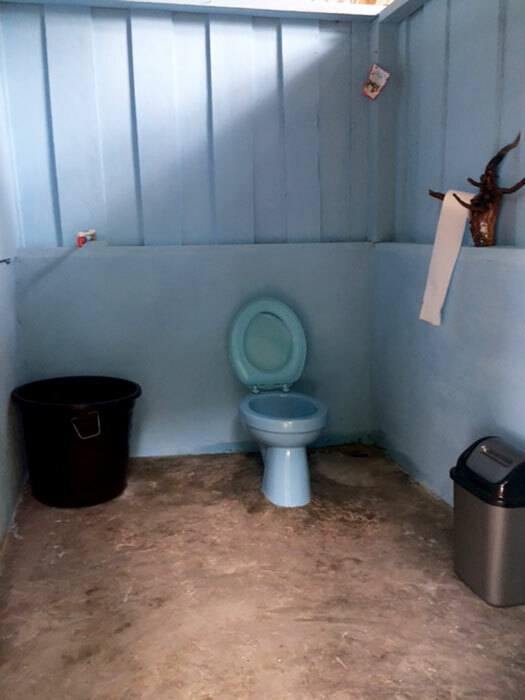 Propre aux alentours de la salle à manger et des chambres et toilettes et douches. Par contre lorsque l’on veut rejoindre les bungalows sur le coté il n’y a pas de lumières le soir et c’est très sale. Pas vu un ramassage des déchets sur les 3 jours que j’ai passé la . Rose la manager m’a accueilli en stress me disant qu’elle est stressée fatigué et me demandant de dire au proprio qu.elle fait bien son boulot…. Elle venait juste de venir me chercher avec plus de 3 h de retard sur le rdv prévu…. Snorkelling intéressant sauf lors de fortes pluies qui amènent leurs lots de déchets et alors on nage plus dans une poubelle . Je ne recommanderai pas cet endroit. lI went to yenbuba 3 nights .first i wasn’t happy because they came with more than 3 and half hours late to drop me at the harbourg. The first thing the manager rose Sid to me that she stressed and she is tired. Ask me to say she is good to the owner……I wonder where I was. The food was good and diverses. The second day I asked her to organize my travel to the next guesthouse for 2 days later she said it is better I do myself…..fortunately I had a Indonesian phone card and I have the phone number …because no help. The place around the toilet bathroom and dinner place where clean but to go to the beach it was dirty …a lot of plastic nobody clean And when it has wind and rain you swim in. Garbage. For me too organize in the western way …for the diner and I never met the Family. Rose take more care for people who rest for long time or some who come to work with tourist …. I would not recommend that place. Except for the food . My fiend and I arrived here after staying at 2 previous home stays that were inadequate. After arriving we found out that paradise does exist, it’s called Yenbuba. The food is the best I had in Papua. The location is simply amazing, you are on the North Western corner of Kri, so great sun sets. The views are fantastic. The snorkeling between Kri and Mansuar is amazing (especially at the Jetty), just watch out when you swim back for the low tide, don’t tread on the low water corals. But best of all, the staff. All of them were super friendly and professional. They keep the place nice and clean and last but not least the manager Rose is great. She speaks English very well, manages the place like its her own and cares about her guests well being. She is very responsive to emails, unlike other homestays I contacted. When Yenbuba is fully booked Rose has 2 extra additional over the water cottages (not yet bookable i think). We stayed there for a few nights and I wished we could have stayed there for a month. The views over the strait are to die for, and the mattresses are really comfortable. Thanks Rose, hope to be back one day. My wife and I have been there a few days in october. The place is really lovely. This is a very nice location with nice sunset. The owner was not very welcoming with turists compared to other homestays we’ve been but still our stay was quite good there. We stayed in Yenbuba in October and we totally felt in love with this place ; each day spent over there was a new surprise and snorkeling in this area (especially just in front the bungalow) was amazing. Rose and the family took good care of us, the food was fresh, good and varied. Potable water, coffee and hot water all day. The bungalow was nice and the (real) bed was comfortable. We really hope to come back to this paradise one day ! Very clean and comfortable rooms with great views! Rose is the best host and very helpful with arrangements and service! This was the best holiday week we spent in Indonesia! I liked everything, even the lack of a conditioner did not feel :) I’m serious about returning to the end of next year! I want to see sharks and manta rays again. Thank you so much Rose, you’re doing a lot of work! We spent 3 nights there but we quickly left because we saw several rats into our overwater bungalow. Food is good. That’s a pity corals are mainly dead in this area. You’re completely right, David. Encountering rats when traveling to a nature’s paradise, is an absolute no-go. Me personally, I haven’t seen rats, but I also felt very much disturbed by the noise of cockatoos, parrots, birds of paradise, loris, sea eagles, egrets and many more. To make things worse, they even left their droppings on my terrace. I think, someone should spray this whole enchanted island, to ger rid of all that annoying fauna-stuff. Instead, it would be a good idea to put up some more generators to provide 24/7 power supply. At least you could have a few cold beers then and drink all your sorrows and concerns away. You could also charge your electronic devices at any time and write more helpful reviews. Thank you also David, for the warning about dead corals. This might help keeping people of your ilk away from Raja Ampat. We had an amazing week at the Yenbuba Homestay. We were lucky enough to stay in one of Rose’s new over water bungalows overlooking the strait between Kri and Mensuar. We could witness some amazing sunsets from the veranda of our bungalow. The bungalow also had a very nice bed with a good quality mattress, mosquito net and also some shelves and a private veranda with a small table, two chairs and a hammock. From what I’ve seen this goes way beyond what most homestays provide and exactly what you need in such a place, not more, not less. The food at the homestay was plenty and delicious. I do not eat fish, but I can imagine a fish lover would be happy for an occasional fresh grilled fish for the dinner, but this is just an idea, as said, we were perfectly satisfied with the meals we got. They were also very flexible, it was never a problem to get an early breakfast or a packed lunch if we needed it because of a day trip we took. The nature around Kri is just amazing, both under and above the ocean. We’ve spent most of our days snorkeling either at the reef between Kri and Mensuar or the other reefs around Kri which you can reach by foot. You can also combine a snorkeling along the reef at the northern shore with a visit at the Yenkoranu Homestay (first pier) if you fancy a cold beer. While snorkeling, we’ve seen an absolutely amazing variety of corals and fish, giant clams, turtles, eels, sea snakes and reef sharks. About Rose, she is the heart, the brain and the soul of this operation. Communication with her through emails is very easy. She does an excellent good job at running this homestay, she will do her best at helping you during your stay any possible way you need, be it a chamber pot, a pickup around Kri in case you are stranded somewhere. Many thanks also to the family who owns the homestay, cooks the food, drive the boat for the pickups and keeps the grounds tidy. There was one single thing with which were not quite happy during our stay. There is quite a big amount of thrash of all kind around the homestay outside the nicely maintained grounds around the restaurant and the bathrooms. The situation was especially bad around the path to the new bungalows. These areas should be cleaned up as soon as possible! All in all, we had an amazing stay here. 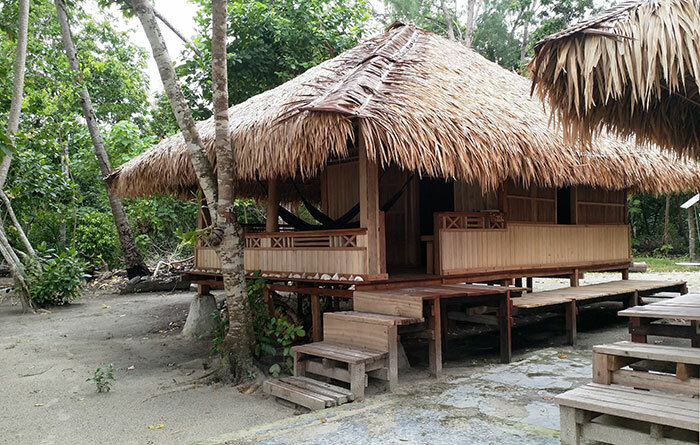 Raja Ampat is fantastic and so is this homestay. We really hope we will get the chance to come back some day. We can’t believe the good comments we read before booking our stay are real ones. Rose, the manager, is not welcoming tourists and she’s a negative person, who is always criticizing people. When people book for less than 1 week or ask questions then she dislikes. She doesn’t give any advice, and organizing a simple day trip is complicated (very simple boat, not often available). We keep a close watch for fake reviews Sylvain, and can assure you that the comments we publish are all from real guests. We don’t censor comments either. Good or bad, constructive criticism or just destructive, empty opinion: As long as they are civil, we publish them all. Rose is a perfect and fantastic host, TOP! !The homestay is beautiful and very well organized! . Always a lot of Food really really good!The holiday was a Paradise in yenyuba homestay!! This place has been the highlight of our trip in Indonesia. It is like paradise. Even though I have some troubles with insects I would have loved to stay there longer. The water is fantastic, everything you see under and over water will be just an amazing memory. We have been lucky as we took part on a snorkeling day to Pianyemo and beyond. Never seen so many corals and fishes in my life! The home stay is very nice and clean, Rose is very kind and helpful, the food they were offering was just great! I miss this place a lot!!! This place is truly beautiful-the over water bungalows are gorgeous and it is so nice to wake up to the view every day. Very clean and there is loads of good food every day. 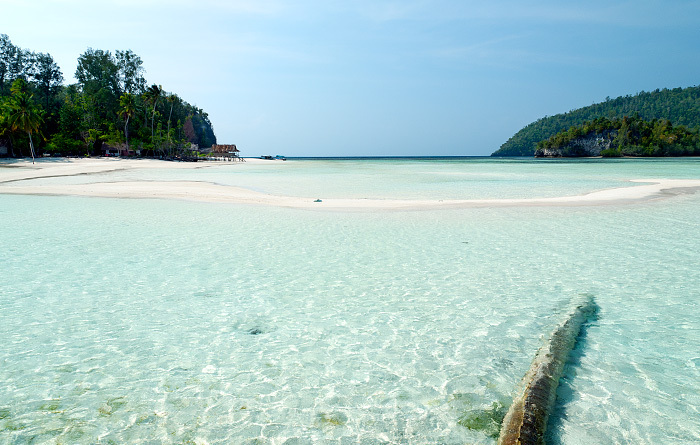 The water around is crystal clear and great for snorkelling, you can also easily cross over the sand banks to yenbuba jetty to snorkel around there too. We saw loads of amazing stuff, they are lots of sharks around, including baby ones right next to the bungalows which are amazing to see. Rose is an hilarious host, we ended up going to sorong with her (and Cindy-the kitten!) when we left and she took us to a great food stall. We didn’t dive from this home stay so we can’t comment on that for this place. Would definitely recommend this place, especially for relaxing/beauty-the water bungalows are pretty luxurious and the area is stunning. We stayed at Yenbuba homestay for 4 nights at the beginning of August. For us, it was the best choice for our first journey to Raja Ampat. The communication with Rose was excellent. 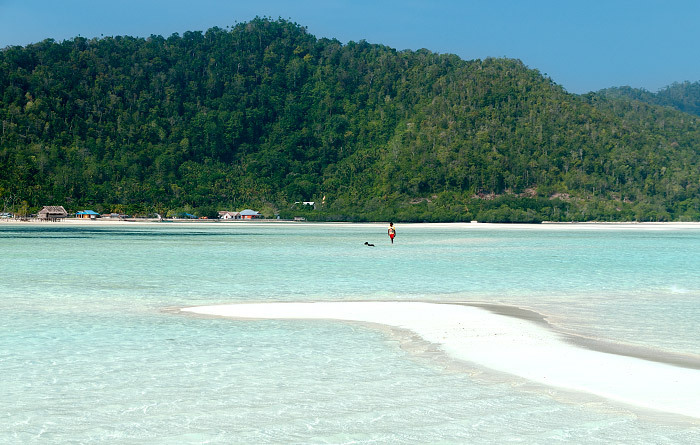 She replies quickly to emails and message, which is great as Raja Ampat is still quite remote. We felt very safe to book our stay at Yenbuba. The journey from Sorong Airport to Kri Island is easy. It’s described very well at this website. At Waisai harbor we were picked up by the owner of the homestay and his son. They have a small fishing boat. It was a true adventure to go trough big waves for one hour from Waisai to Kri Island. Be prepared to get wet ;-) However, August is not the best month to travel to Raja Ampat because of the high waves. We loved it. Put all your documents and electronics in a zip bag and store it properly. The food at Yenbuba is cooked by the family of the homestay and it’s absolutely great. It’s plenty and the taste is fantastic. We had soup, vegetables, fish, chicken,….. it was very good and very fresh. 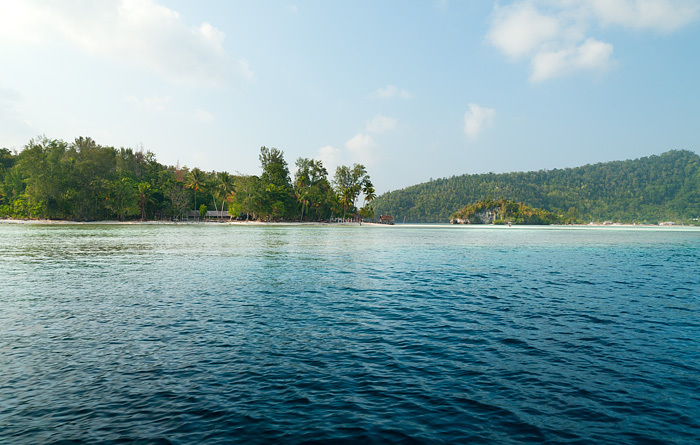 Snorkelling is perfect right in front of the homestay. We aren’t divers and still saw lots of fish and turtles. Furthermore you can go on trips for snorkeling etc. Just ask Rose and she will arrange. Very easy and quick. About Rose: Rose is a great host. She manages the homestay and speaks very good English. She is the brain of the organization at Yenbuba homestay. It’s very safe and clean. Prices are fair. From what we saw at other homestay nearby, they are not as safe and good is not that great. Personal tip 2: 3G works very good at Kri island if you have Telkomsel. We had it and we were able to call our beloved ones over WhatsApp easily. Personal tip 3: Take a lot of care of you personal belongings on the ferry from Sorong to Waisai. Unfortunately a lot of money was stolen from us. You will love Yenbuba homestay if you are ready for an adventure and want to see something DIFFERENT than usual. The beaches are absolutely fantastic, you will meet new people and share your stories. You can also climb the little mountain at Kri Island or go over to Mansuar. And go to Pianemo, unfortunately we didn’t! Yes, power is only there for some hours. Yes, there are a lot of big insects. (Like REALLY big!) People say there are snakes but we didn’t see any. It is not a 5 star hotel where you have All Inclusive and 10 pools. If you want this, better go somewhere else. It is a 5 billion star hotel if you look at the sky it night. Kri island is very beautiful and i guess yenbuba homestay is the best choice for staying at. Rose is very much concerned that everything runs properly and that boat pick up’s and food are on time. (When you are not on time because of diving, lunch awaits you still!) Food by the way is delicious and various every day. There’s always enough for everyone. The bungolow half over water is i think as nice as the fully overwater bungalows and its even cheaper and you have more privacy there. There is no bintang at yebuba. There’s no fridge, best is to bring it from waisai or sorong and get used to drink it warm. Located just a walk over the sandbanks at lowtide from yenbuba village away makes it easy to go and buy zigarettes or go snorkling at the jetty. Yenbuba jetty is great snorkling with blacktips, wobbegongs, giant trevallys, school of batfishs, huge bumphead’s, school of giant and smaller barrakudas, turtles and so on. Really world class snorkling. Diving can be arranged by rose or you just walk along the beach (lowtide) and organise yourself. But please as we were witness of a diveaccident at koranu fyak (divemaster dove with empty tank, eventhough the finimeter showed him 200bar – on 30m he had after 10min suddenly no more air. Lucky him he stayed that time not too far from us as he usually did and i’m a dm and know at least theoretically how to handle emergencys), make sure that you check you’re eqipment and tank properly, organise buddyteams if the guides don’t. 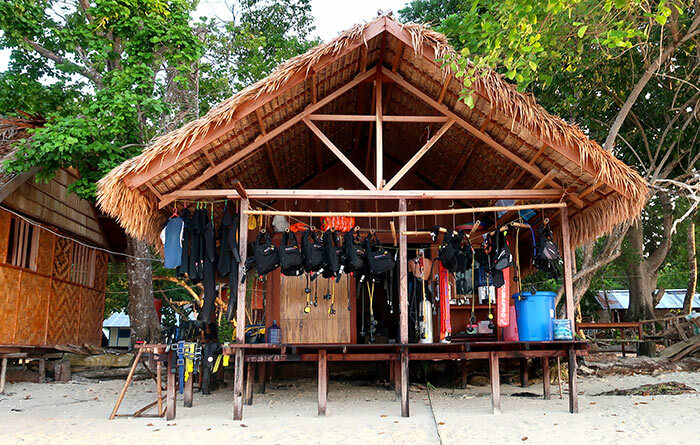 All diveshops beside kri eco resort have no padi or equal lisence to take you underwater. Be prepared that papuan style usually means they are on delay and sometimes they promise you to dive but they don’t even have enough tanks or equipment. Koranu fyak as no good divemasters at the moment. Not enthusiastic at all. They seem to be bored, so that’s not where you wanna spent you’re money at. Today we try delfin dive. I hope they are better underwater – we are now waiting for two hours to go diving – that’s why i find time to write my comment. Lots of words from my side. Rose is super, yenbuba homestay is great, kri island is beautiful!!!! Just make sure you’re safe while diving and you will enjoy your trip to raja ampat! Thanks for taking the time to write a review Jenna, and thanks too for reiterating the need to check everything and make sure you have a dive buddy organised. 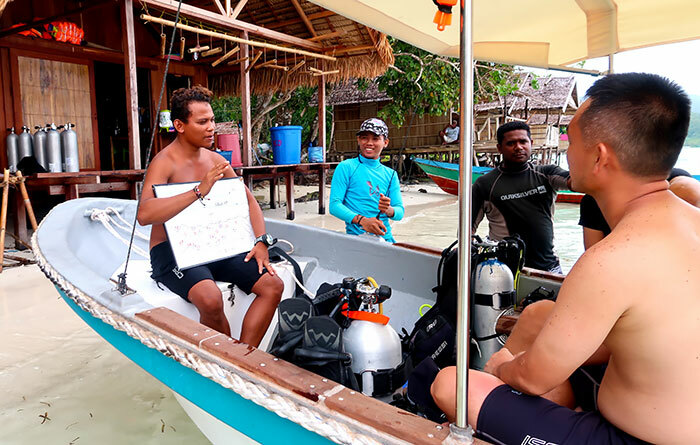 Just a note: Wobbegong Dive Adventures at Koranu Fyak is actually a fully licensed SSI dive center and the owner Ruben is a properly qualified instructor. Of course that doesn’t make much difference if guides are not properly trained. It’s important that everyone is aware of this information before committing to diving in Raja Ampat. We spent 8 days in Yenbuba homestay with Rose. We REALLY loved the bungalow over water, it was one of our best week in our life, even more awesome than the pictures on the website, if that’s possible! You arrive on the island with a big smile on your face until you painfully leave the place… The location is close to paradise, you have to see it to believe it. It’s easy to organise boat trips with Rose, with fair prices, you share the costs with the other people. Boat drivers are nice people! The price of the bungalow is really fair too. Food is good, we especially liked the breakfasts. The snorkelling is really beautiful, just 100 m from the bungalow you can see turtles and sharks, even dolphins! Rose is really fun and she has a lot of stories about her country, she’s a real insight into Indonesian life. She answers really quickly to your messages. You have electricity in general from 6 pm to midnight, sometimes even later, which is more than enough. Few mosquitoes. We stayed at Yenbuba for three nights in the end of July. We were very happy with our stay and the manager, Rose, is very friendly and good fun! The bungalows overwater are perfect with a great panoramic view over the water. It is easy to plan all kinds of trips and there a great snorkling just in front of the bungalows and at the Yenbuba jetty! Also, the food is great compared to other homestays. We would recommend this homestay to anyone coming to Kri. I just turned up and stayed at Yenbuba a second time. The bungalow is excellent. Rats were not a problem this time. Unfortunately, Rose, the very capable manageress, was on holiday. This meant that the quality of service and cooking was much lower than it was last time. I recommend that you find out whether Rose will be there before you make a reservation. It’s pity that we can’t rank with 6 stars. Everything was absolutely perfect, pick up from Wasai harbour, accomodation, delicious food, trip etc. House reef was full of coloured fishes and also turtles and sharks. Next time we have to stay much more longer than 5 nights. Thank you Rose and your local staff for everything. I had 5 wonderful and unforgettable days in the waterbungalow at Yenbuba homestay. Rose is a brilliant Manager who will try to do the maximum to make you feel home. The food is exceptionally good, the rooms are spacious and the bed very comfortable. Above that everything was very clean and the dining area is a cosy place. The views are breathtaking and the location is extremely peaceful. The excursions and transport to Waisai is well organised. It was the perfect place to relax and enjoy a dream holiday without worries. 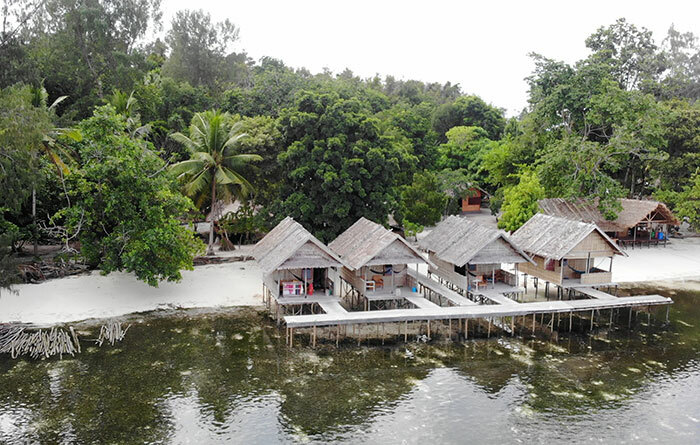 Simply the best place to stay when going to Raja Ampat. J’ai passee 5 nuits inoubliables dans le waterbungalow a Yenbuba homestay. Rose est une excellente Manager et fera son maximum pour garantir un séjour impeccable. Les repas sont exceptionellement délicieux, les chambres spacieux et le lit comfortable. Tout est trés propre et le restaurant est un endroit agréable. Les vues sont spectaculaires et le lieu est tres calme. Les excursions ainsi que les transports sont trés bien organisés. C’est le meilleur endroit a Raja Ampat pour se relaxer et de profiter des vacances de rêve sans soucis. Abbiamo soggiornato al Yenbuba Homestay per 9 notti a febbraio 2017. E’ stata un’esperienza fantastica, Rose è la manager della homestay, ed è una donna meravigliosa. Noi abbiamo soggiornato in un bungalow sull’acqua, sono molto belli, puliti e curati, la passione che ci mette Rose da ottimi risultati, gli ospiti si sentono come a casa. Il cibo è molto buono, curato e ben servito. La posizione è la migliore dell’isola e grazie alla bassa marea si formano lingue di sabbia di incredibile bellezza e si può raggiungere la vicina isola di Mansuar. Per lo snorkeling ci sono diversi ottimi punti, tutti a brevissima distanza. E’ possibile organizzare escursioni tramite Rose, oppure ci si può aggregare con ospiti delle homestay vicine a seconda dell’escursione, del numero di partecipanti e della distanza da raggiungere. We stayed at Yenbuba Homestay for 9 nights in February 2017. It ‘was a fantastic experience, Rose is the manager of the homestay, and is a wonderful woman. We stayed in a water bungalow, are very beautiful, clean and cared for. The passion that puts us Rose by excellent results, the guests feel at home. The food is very good, nice and well served. 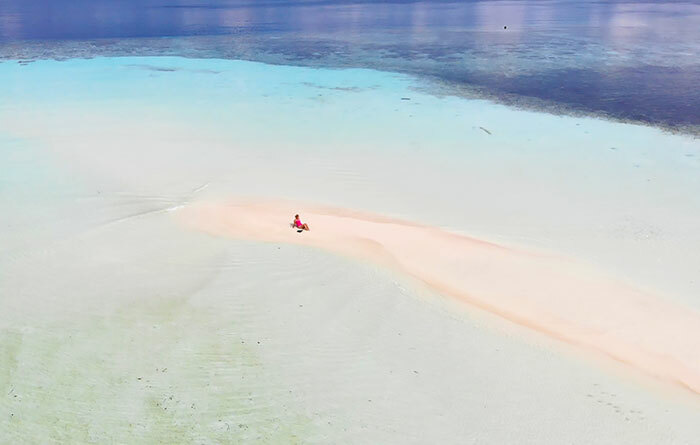 The location is the best on the island and due to the low tide are formed of sand of incredible beauty and you can reach the nearby island of Mansuar. For snorkeling there are several excellent points, all very close. And ‘possible to organize excursions by Rose, or you can aggregate with guests of the nearby homestay depending on the excursion, the number of participants and distance to reach. We stayed in one of the 3 waterbungalows in Yenbuba Homestay in January 2017. We planned to stay 4 nights, but ended up staying 9 nights (and had to leave because it was booked by other people). It was our first stay in Raja Ampat and what a wonderful experience! The 3 overwater bungalows are new, clean, good bed with good musquito net, private, airy. To us it seemed that Kri is developing pretty fast, but this western tip of Kri where Yenbuba is located, is still pretty quiet. We really liked the house reef, lots and lots of fish and often we went snorkeling from Yenbuba to Yenkoranu, walking back. Also with low tide walking on the sandbanks in the direction Yenbuba village is nice. We did many boattrips to surrounding places and reefs, nearby and small distances with August, the owner of Yenbuba. He is a very nice man and knows lots about marine life and where to find fish and reefs. Several trips further away we did with Raymond, the owner of Mangkur Kodon, around the corner. All the trips we did with him were fantastic, only a pity that he was not always in the mood to do trips. To share the cost of boats / fuel, we also did trips together with guests from Mangkur Kodon. Food in Yenbuba was very ok, though a bit repetative, but everything has to be brought from Wasai and as there is no electricity there is no fridge to keep things cool so choices are limited. As I was eating Veg food, they catered very well with that. The heart of Yenbuba is Rose. She is an excellent host, loves the area, knows a lot about Raja Ampat and shares her knowledge with her guests. I think without Rose, Yenbuba would be a different place. Also, she was very fast in replying on my reservation request. Thank you very much Rose, August and all other people of Yenbuba for a wonderful wonderful time!! The bungalows over the water are very nice- and cost 400 000, a bit more than others. But you sleep in a real bed. Rose is an excellent host and organiser. Playing Uno was fun for me who usually never plays with cards. The evenings were friendly, amusing, and without too much beer. Very enjoyable.Food is good. Corals and snorkelling are great. The only drawback are the rats in the roofs: they did not come down but you hear them at night. The neighbour’s idea of importing some cats seems a very good solution. But perhaps my dislike of rats is abnormal. Rose is a wonderful host. She is very attentive to her guests comforts. She was good company for this single traveller – introducing me to friends and took care with my food allergy. The homestay is well kept and very good food. Three nice new bungalows over the water. Very nice beach and the and the sandspit to loll-on at low tide. We stayed in 9 homestays and Yenbuba was by far the best of all of them. The bungalow is very well equipped even with a real bed. The location is simply great next to a reef full of corals, turtles and sharks. The manager Rose is very nice and speaks English. We played dards or Uno with her and the rest of guests every night:). The best food that we ate in three weeks all around. Definitely we will come back! We stayed 14 days in October 2016 at Yenbuba and loved it. The setting and the new bungalows with sunset view are great. The service was good and the cleanliness as well. Especially Rose is taking care a lot for their guests even she organised a nice birthday cake for Verena and we coud join her to Waisai to the festival. The food was good and changing nearly every day. The snorkling in front of the homestay is good and arround the corner in the next bay its great. The sandy areas in diretion of Mansuar are like a private pool and its fun to play in the shallow when the drift is strong. Diving with the neighbours dive shop is not recomandable as the safty is not good and the equpment is very old. Hi Frank & Verena and thanks for taking the time to write a review. In the interests of guest safety, it would be best to name the operator you thought unsafe. We went to Kri after spending some time in Arborek and Mambefor. The owner was quite nice. The food was decent however we had no meat nor fish unlike in other inns. They provided only veggies and eggs so in term of food they were simpler than the others. I wrote some of my experiences in my blog maikamondlicht.blogspot.com. might be useful for those who wants to go. I felt a little bit disappointed with the reef just in front of the homestay. Is in very bad condition, and only you can see some corals. I would subtest to the homestay to try to restore the coral reef in front of, I have seen other projects in other islands and in five years you can see new corals growing up. can you elaborate more about your disappointment with the home reef? the latest review by Francisco Furió on 13 dec described a reef with coral turtles and sharks. I spent 4 nights at Yenbuba homestay and had most fabulous time. The newly built bungalows are clean and comfortable as per all pictures. Watching the sunset from the hammock was just a bliss. The entire Yenbuba crew was lovely and welcoming. I felt like a part of the community. Food was delicious and plenty with fruit and leftovers available all day. Rose is the most helpful and entertaining manager and she sorted out Piaynemo trip for me. Fantastic snorkelling is available just outside the bungalows. I also took 4 dives with neighbourly shop. Diving with Ray was fantastic and I much recommend going with him as he is really experienced and passionate. I’m grateful I could visit this stunning part of the world and Yenbuba homestay made it really special. I hosted in Yenbuba homestay for a week. I had a wonderful experience. The place is perfect for me. I really enjoyed the nature and peace of this place, is even one of my favorites in Indonesia. Rose is the manager and she is really helpeful, Agus is the owner, he dosent speak english but he always is around if we need something. Food is good and the place is clean. I definetly recomend this place to stay in Raja Ampat. I stayed also at yenbuba for three nights , to me it felt like I am at home with my family. The food was great and if I needed any extra food rose was there for help. Every night we sit all together and have dinner and talk and then come a long night of uno games and fun. I already miss staying there. And I agree mosquitos are a problem at kri so do be prepared. We spent 3 nights at Yenbuba’s newly built over the water bungalows. It’s good quality and clean as you can see from the posts pictures. Owner Agus and family was nice and kids were fun to hang out with, games and all. Rose is the manager and speak good English so there is no problem communicating what we need. It is a homestay but we felt like a little hotel experience. Mosquitos seems to be the main problem in Kri, it’s just everywhere especially during the night, so be prepared. Snorkeling is exceptionally good south of Kri, so start from Yenbuba and head south then west, it is possible to snorkel all the way to Yenbuba Village, just be careful of current. The home stay from Rose is very Dirty!!!! She give not the services mentioned!!! The food the first day was good but later going in bad because there is not frigo!!! The food is not enough and she not take more on the table! She sell the excursion but she not have a boat for excursion! You will stay in a beach for some day with out go in another place! If u re lucky you found a exsternal boat! No diving, but at the phone she say yes on a close bungalow!!! The only one execution that she proposes in a Piaynemo! 6.000.000 like a luxury resort but with a 40 engine old boat! One hour distance. The only think nice is sand bank in the other homestay that you can go direct and that they clean little beach the beach! Rose the owener disturb all day with photo for its facebook page but not care the problem! I was about to write my review but I felt the need to reply to this. Based on the number of good reviews here from other guests and one more from me later, We can safely assume Davide’s experience is a one-off and highly likely to be expectation not met. I wondered why Davide did not move to another guest house/resort/homestay since there are really plenty available in Kri within walking distance or short boat ride. 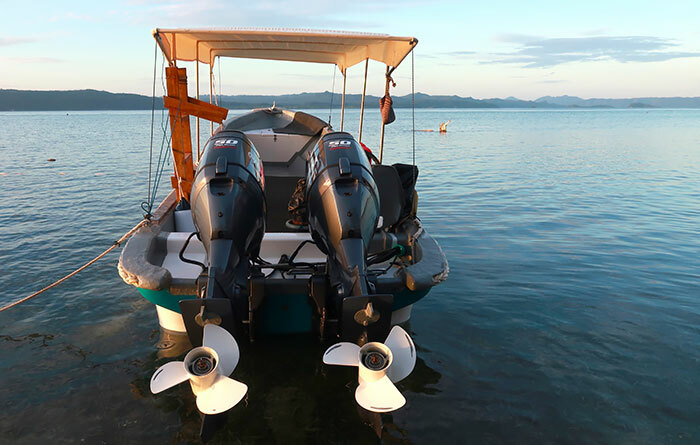 From what I understood about the homestay here, most boats are just one and mainly family owned and not for guests, so schedule of trips must be planned and subject to availability especially when another boat from other guest house/homestay/dive resort is involved. There are plenty of places offering diving in Kri, one next to Yenbuba, one south of Kri(walking distance). My personal opinion: it’s just a rant from Davide because his expectation wasn’t met. I am sure Hanging Garden in Bali would serve him just fine if he’s willing to pay for it. The homestay is very nice, it has rooms over the water, I think this is one of the best. The owners don’t speak English but they are very friendly and helpful. If you want to dive, you have to walk a bit to find a dive centre. The food was great and tasty, usually they do it spicy. This Homestay is just unbelievable. The food was so delicious that I get hungry just thinking about it. The location is fantastic and the family is extremely heart warming! Hi how much did they ask? Hi JB – We’ve been in touch with Yenbuba and they’ve provided us with their new prices. The prices shown above have been updated since Anna’s comment and are the current prices. We spent 4 nights at the end of august 2016 at Yenbuba Homestay in one of the 3 recently finished overwater bungalows. We had the best time of our lives at Yenbuba! The overwater bungalows are quite spacious with brand new beds, matresses and mosquito nets. Even electrical light and a plug connector are available in the room. Everything is basic but very clean. When sitting in front of the bungalow on the landing stage, you have a wonderful 180° view from east Kri over south Waigeo to east Mansuar/Yenbuba village. 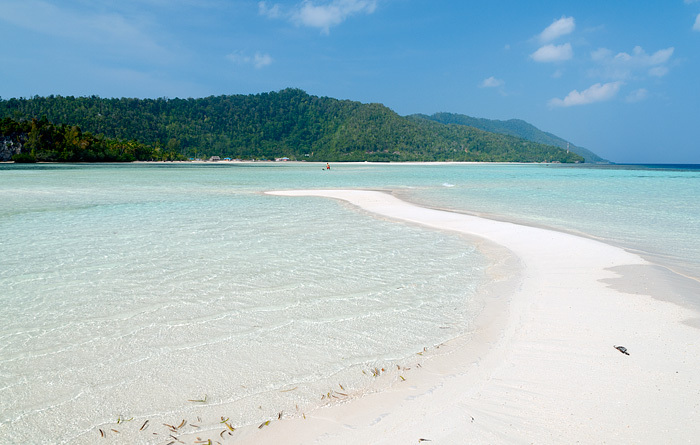 The Mansuar sandbank is just 100m walking distance away and you can easily walk to Mansuar during low tide. Augustinus and his wife have been very kind and friendly hosts and Mama Sauyai takes care of your stomach 3x times a day (I didn’t belive that when reading all the reviews upfront but it was true – mostly different types of fresh fish, vegetables etc.). We will definitely come back Raja Ampat and especially to Yenbuba Homestay again since it has been the highlight of our 6-weeks Indonesia trip! I stay here for 3 nights. Good service from everyone in homestay. Food is good in quality and taste, but it will be better if homestay separate food for each group. Sometime each group can not eat food at the same time. We slept on new matresses and the three new sea bungalows have been finished now. The food was really good, Everyone was very friendly, attentive and helpful. I`d like to thank them again for everything. I want to add my rating. We spent 9 nights out of our 15 days at Yenbuba homestay. Very well located, 5 star snorkeling right in front of the homestay (sharks more than guaranteed every time) , food was excellent and plenty (Mama cooks and takes care of your stomach as I´ve never seen before), bungalows and toilets are basic (as every other in Raja Ampat, other than the 100 dollars night resorts :) ) but very clean.I more than recommend staying with Agus, mama , Naomi and Tomy (adorable kids) , when we go back we will surely stay with them again! My friend and I had the best time at Yenbuba Homestay! Wonderful family with adorable kids. They took good care of us and made delicious food. The room and bathrooms are clean. They are also next door from Mangkur Gordon dive shop. This home stay is in a good location. When the tide went down, we could walk from Kri Island to Masuar Island to visit Yenbuba Village and go snorkeling. We definitely want to go back there. This is such a wonderful family! Did stay 12 days. Very good food! Very tasty! The homestay is clean and well maintained. 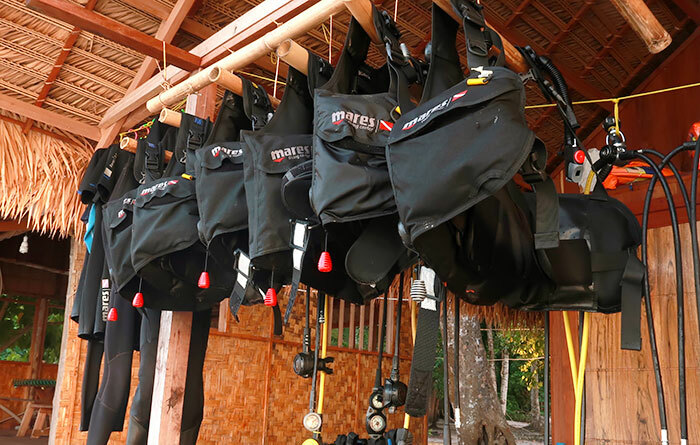 Snorkeling is good and next door at the diveshop you have a great team to dive or go with Lucky for a snorkel trip. Stayed here early January 2016. Absolutely loved it. The family who own Yenbuba, are friendly, kind hearted people who made our stay so good.. we changed plans at the end so we could finish our stay with them. Accomodation was basic as is most on Raja Ampat. Hut consisted of bed (not on floor) and a simple table. 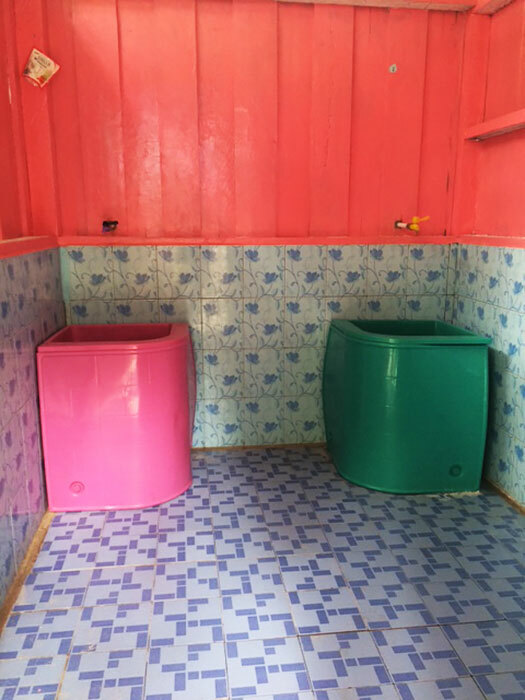 Bathroom had a dip mandi & squat both housed separately. Everything was clean and ordered. Food consisted of fish, rice, noodles always with some sides of vegetables and the occasional omelet. As with everything in this place, care was taken & every meal while repetitive was tasty & had flavour. Location was also a 10/10. The sunsets were sublime & the brand new over water huts being built will be a welcome addition. We as a party of 4 loved Yenbuba. We will be back! I stayed at Enkansinaf Homestay 3 days in August. I really liked that the area is very large and clean. The owner and his family are doing everything possible to make your stay in this place was a joy to you. I wish prosperity Yenkansinaf Homestay!